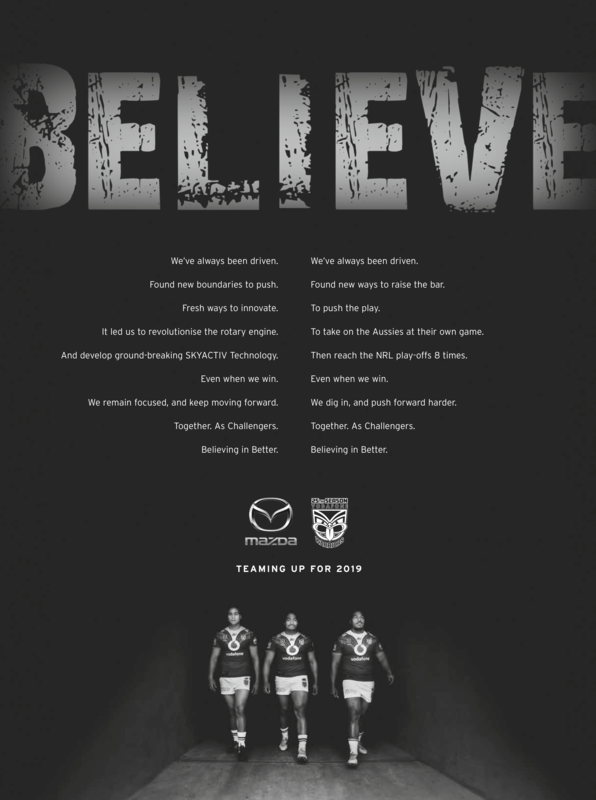 Mazda has signed a sponsorship deal with the New Zealand Vodafone Warriors which sees them team up for the 2019 season. And 99 are letting fans know about it. The work highlights how this new sponsorship is more than a logo on a shirt. The two brands align philosophically; sharing a challenger spirit and a belief in constantly striving for better. Print and film executions will help fans make sense of the partnership and give Mazda a launchpad for the rest of the year’s activity. Mick Stalker, executive creative director 99 is the first to admit he knows little to nothing about rugby league but finds it easy to recognise the parallels between the two brands. A launch involving social activity, print and an online film, draws compelling similarities between the two. With the passion on both sides of the sponsorship, it promises to be a powerful partnership.